Marston is one of the publishing industry’s leading distributors, providing a comprehensive and impressively high-quality range of fulfilment and print services. We handle a huge cross-section of books, journals and electronic products from publishers throughout the world, straddling the trade, academic, STM, arts, religion, educational and professional sectors. Marston’s company ethos is to be as flexible, reliable, and proactive as we possibly can in our relationships with publishing clients, and to be highly customer-oriented and professional in our dealings with customers. And since we work alongside publishers and customers from all four corners of the world, nothing could be more important! Our two modern high rise facilities have 136,000 square feet of working area including 3 million cubic feet of storage capacity. We deal with around 300,000 orders per year. We send out 8.2 million books and periodicals each year. We have approximately 45,000 trade account-holding customers in over 200 countries. 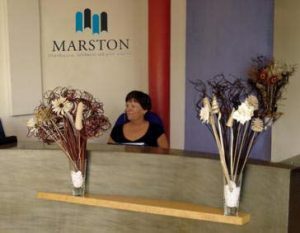 150 staff work at Marston, many with 10-20 years of service. Our busy Customer Service and Client Service departments deal with about 600 phone calls every day.